Uhhh, what? That’s how I felt about this movie. I wish I could put it in a little more detail, but that’s my immediate reaction. A few months ago, I found a book I bought a couple of years ago that Fangoria released called “101 Best Horror Movies You’ve Never Seen” that contained, well, I’m sure the title tells you what it contained. It was mostly movies that were somewhat obscure, never made any money at the box office, or maybe a famous director’s lesser-known film. To be honest, most of the movies you have seen on here lately/will be seeing soon were because of this book. This movie was actually the movie depicted on the cover, so I figured it had to be pretty decent. This blue-skinned freak of nature runs around naked quite often…if you’re into that sort of thing. The story opens with researchers discovering a skull that has mysterious origins. While enjoying the worm festival (yes, it’s a worm festival), a mysterious woman steals the skull. It turns out that it is the skull of a legendary beast known as the white worm, which this woman has been worshipping. She also has fangs and some sort of weird acid spit, which I assume was intended to be similar to a cobra spitting venom. 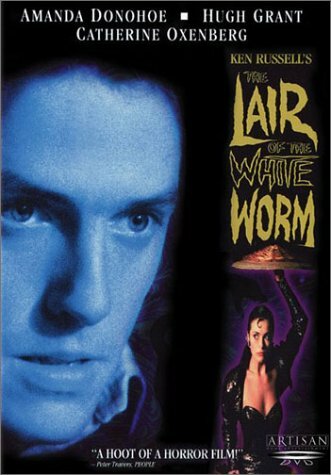 To appease the giant white worm, this woman then needs to sacrifice victims to it, which she attempts to do, but is thwarted and she herself is thrown into the white worm, which for some reason is good enough for the worm and he goes back to bed. I have a feeling this is symbolic…of something. If it sounds like that plot didn’t make much sense, it didn’t. I also cut out a lot of stuff that didn’t really make any sense for sake of efficiency. I wish I could say more about this film, but there just wasn’t anything notable. I have seen plenty of worse, and plenty of better films, this one just kind of existed. 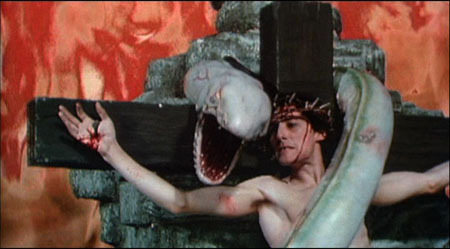 Highlights include the very bizarre and confusing hallucination scenes involving Jesus, naked nuns, and a polarized effect that just kept coming out of nowhere. Also, when the weird snake lady was about to fall into the white worm’s mouth, she was hanging onto someone else’s foot, and someone stopped her by slowly cutting her hand clean off her body. My favorite part involved Hugh Grant (yes, that Hugh Grant) swinging a huge broadsword to cut a lady in half, and the momentum of it causes him to knock over a precariously placed drum set. This film was just really weird, and had a very Dead Alive or Cemetary Man tone to it, where you couldn’t tell if it was taking itself seriously or not. The perviously mentioned films do a much better job of it, of course.